While last week’s launch of the federal spectrum auction gave the green light to 5G in Canada, many communities across North America are choosing to build and operate their own fiber-to-the-premises networks. An innovative new Canadian website – Connected Communities – explains the many benefits of community-owned fiber, and provides a blueprint for how towns and cities can make it happen. Wired fiber is faster, safer, cheaper, greener, more reliable, and more data secure than wireless 5G – the 5th generation of cellular technology. This in-depth report explains why. Community owned fiber keeps telecommunications infrastructure in local hands and keeps it responsive to local needs. From improved emergency services and economic opportunities to resource monitoring and distributing locally generated renewable energy – the manifold benefits of community-owned fiber make it the truly smart choice. As Senator Blumenthal uncovered in this Senate hearing, 5G is being unleashed with no pre-market safety testing. Wired fiber can essentially fill the same functions as wireless 5G, without the risks. The Globe and Mail’s European Bureau Chief Eric Reguly discusses the health risks of 5G here. In the wake of the Huawei scandal, this article reveals the sinister cyber and national security risks of 5G. Beneath the marketing hype, it is unlikely wireless 5G will fulfill its promises. (Learn more here.) Rather than heralding the future, 5G is shaping it to telecom’s advantage. Cities like Chattanooga Tennessee, Portland Oregon, Olds Alberta, San Francisco and Seattle – cities that value data privacy, autonomy, local prosperity and wellbeing – have chosen or are choosing community-owned fiber. The telecommunications highway today fulfills the same function that roads and railways once filled for trade and commerce. It is essential that this infrastructure be not for meeting corporate interests, but for the public good. To learn more, visit Connected Communities and spread the word – wired networks offer safe, net neutral, fast and reliable connectivity for years to come. 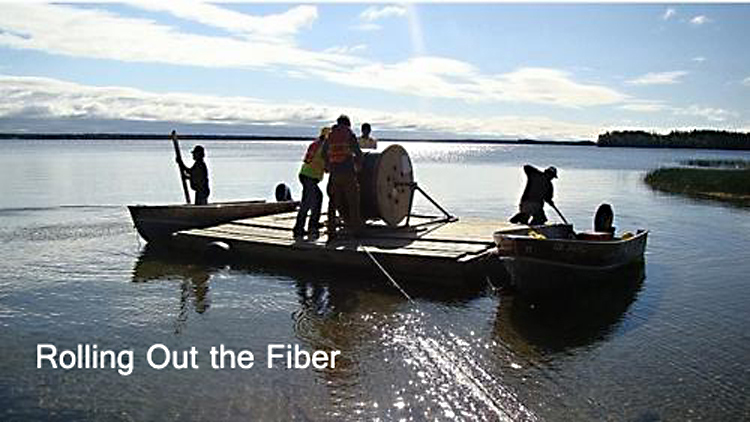 Rolling out the fiber optic cable connecting the two remote First Nations of KI and Wapekeka in Ontario’s far north. Photo by Luke Sainnawap. Envision this: Your community owns and controls a high-speed information highway that helps secure a healthy, prosperous, and sustainable future for all. Let’s bring community-owned wired high-speed internet to Canada’ s First Nations. To protect human health and the environment we need fiber without any wireless transmitters attached to it. This will allow us to replace existing or planned wireless emissions in public and private, indoor and outdoor areas with safe and speedy wired fiber-to-the-premises. At the 1st ever Indigenous Connectivity Summit held in Santa Fe, New Mexico in November 2017, there was a general consensus that community networks are an ideal path for Indigenous communities to empower themselves and drive their own connectivity solutions. What are some of the advantages a community wired-to-the-premises fiber optic network can provide? Improved emergency services and healthcare, as well as educational and economic opportunities are just some of the benefits. Here’s how one Nuu-chah-nulth First Nations built a fast, secure, and healthy wired network. This entry was posted on March 18, 2019, 8:20 pm and is filed under British Columbia, Canada, Fiber Optic, fiber-based, fibre optic, First Nations, Nuu-chah-nulth First Nations, Smart City, Wired Smart Cities. You can follow any responses to this entry through RSS 2.0. You can leave a response, or trackback from your own site.